It’s officially winter here in Kentucky, with temperatures getting below twenty degrees Fahrenheit and snow finally starting to stick. Thanks to that, I’ve been on a soup kick lately, and there’s one I particularly like, both because it’s pretty healthy and also because it’s rather easy to put together. This recipe is inspired in part by my local Japanese market, Sakura Mart. This locally owned business is a great way to explore some new products, from the wall of Japanese language movies to beauty products and of course the food. There’s soups, spices, snack mixes, and some of the best rice you can buy. 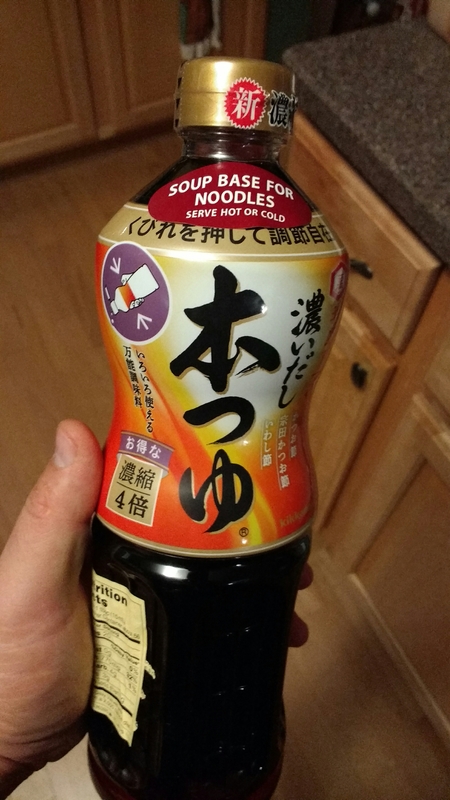 I got the idea here by checking out a soup base mix they sell. It’s got several items you might find out of the ordinary if you’re used to stereotypical American cuisine, including fish stock and seaweed broth, but I promise you that you’ll be surprised by the deliciously warm flavor. 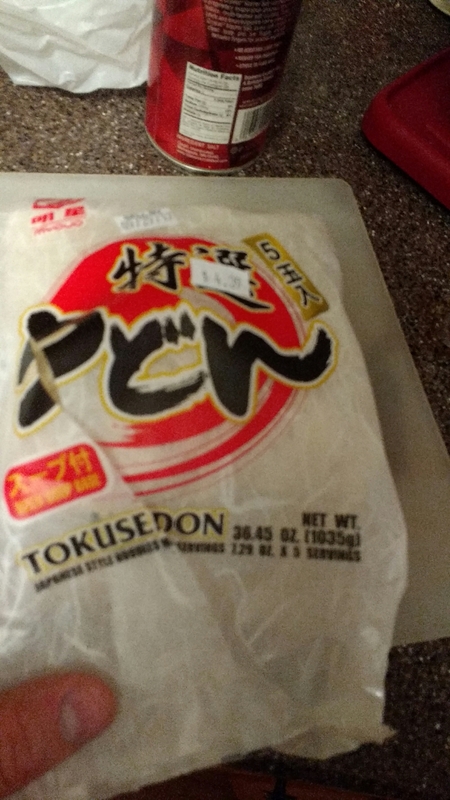 While there I also grabbed a package of udon noodles. These are only a couple bucks and they come pre-cooked. It’s a great item to keep in your pantry for any quick dinner need, and they have a hearty texture that I particularly enjoy in soup. The rest of the items we need are found at the more typical grocery store. I grabbed some green onions, roma tomatoes, mushrooms, and two pounds of fresh tilapia. One of the great things about this soup is that it’s pretty flexible ingredients wise. You can also toss in any variety of squash or greens, and for protein you could use shrimp, chicken, or even tofu just as well. It’s a recipe that adjusts well based on what you already have in your kitchen so it’s handy for days when the weather has you not feeling up to driving out for food but reticent to get delivery pizza for the third day in a row. 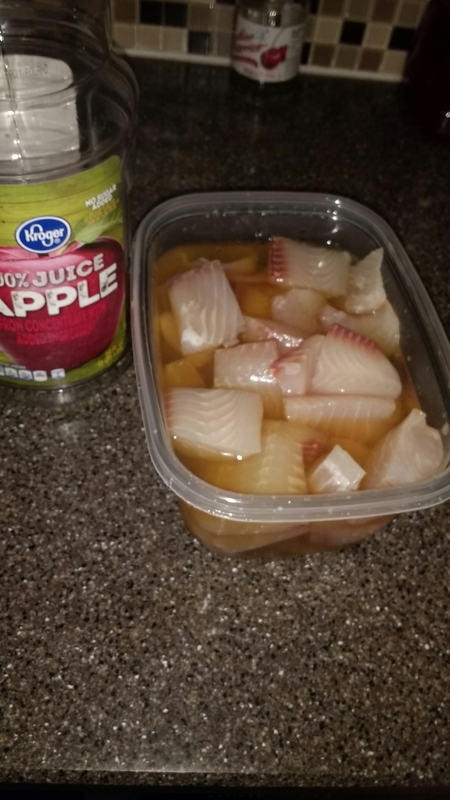 When I got home my first step was to cut the fish into chunks and start it marinating in a mix of apple juice and soy sauce. This will give it time to pick up some flavor. I generally find tilapia to taste a little flat so this will help give it some dimension. Next I’ll slice up the mushrooms and stack them in a bowl with a sprinkling of coarse kosher salt. This will pull out some of the liquid to the mushrooms and begin building our broth. 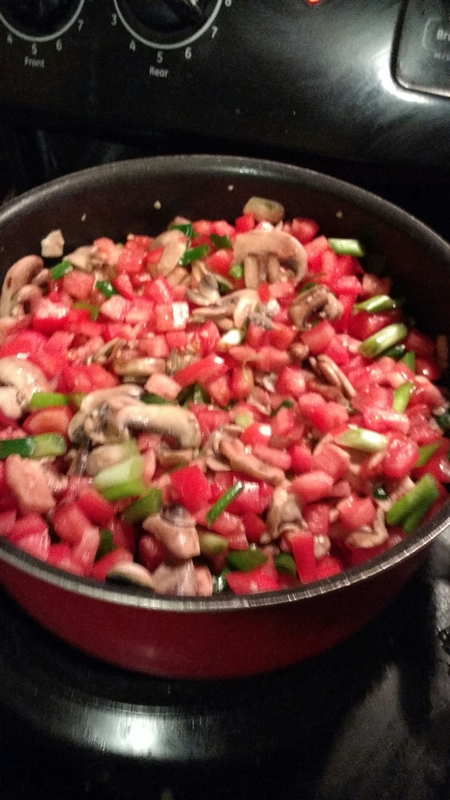 I’ll set the mushrooms aside and slice the green onions and tomatoes as well. Once everything is cut up, we’re ready to start. In a large soup pot, set over medium heat and drizzle in some regular olive oil and a tablespoon of minced garlic. Once the garlic begins to cook, add in your mushrooms along with any liquid that’s drained out if them. Cook over the medium heat until they finish breaking down, should take about five minutes. Mix in your green onions and then the tomatoes. Now get out your soup base. This stuff is pretty concentrated, so we’ll pour in one cup of concentrate and three cups of water. Mix the whole thing, wait for it to come to a light boil, then reduce it to a simmer. Let this go for about ten minutes, then we’ll turn to the fish, which at this point should have been marinating for about thirty to forty minutes depending on how long it took you to cut your vegetables. 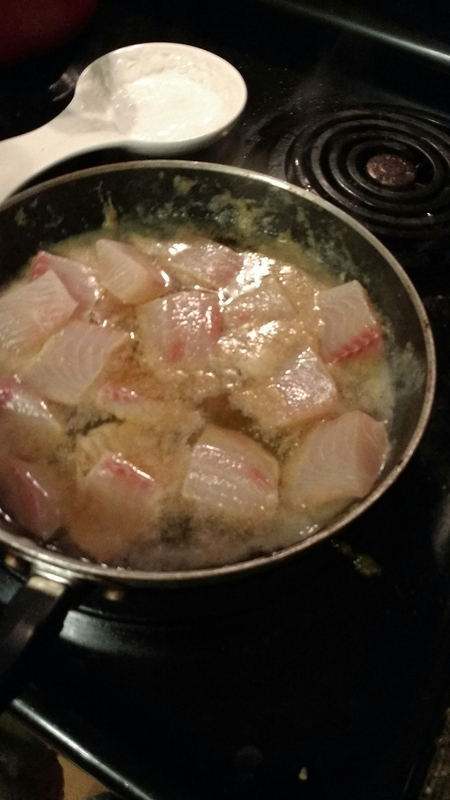 Remove the fish chunks from your marinade and save the liquid. Pat them dry. Place a large skillet over medium heat and add enough regular olive oil to coat. Add some minced ginger and stir toss for a few seconds before adding the fish. Once all the fish is in the pan it’ll probably be a little crowded and that’s okay. Cook for about two minutes before flipping the fish. Wait another minute then pour in the marinade liquid. Let it come to a light boil, then reduce to a simmer and cover with a lid. We’ll let this cook for about five to ten minutes, until the fish is firm. Finally, we’ll open up our noodles. As I said, these are pre-cooked, so they’ll be added here right at the end. They’re packaged with liquid that I don’t necessarily like though, so open the noodles into a colander in the sink. Rinse them off with some cold water, and use your fingers to lightly loosen them up. 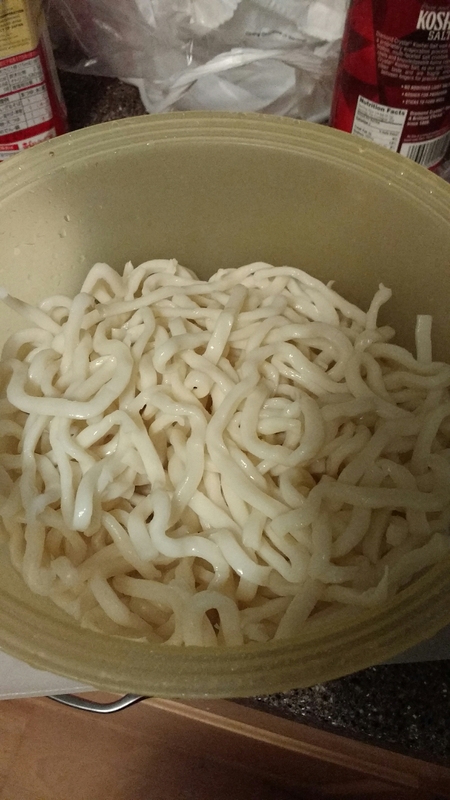 The noodles will probably come out of the package pretty tightly packed together and loosening them like this will allow them to cook more evenly. Once you’ve rinsed them pretty thoroughly, let them set in the colander until we’re ready for them. We’ll check our fish to make sure it’s done, then add it to the soup along with all the liquid. By cooking the fish separately we had an opportunity to get a little more control over the flavor and texture profile of the final dish. Once the fish is added in, taste your soup and add flavors like salt and pepper to taste. I usually like some spice here, maybe some chili paste or sriracha, but I’ll hold off because one of our diners this evening is three and she may not enjoy the heat. 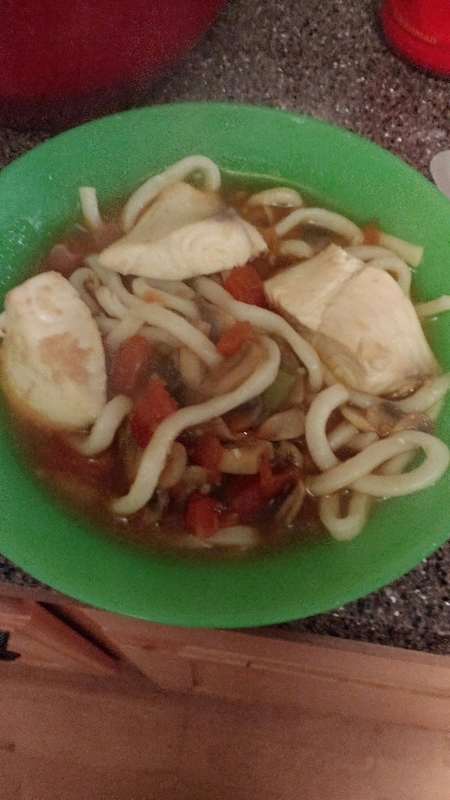 Once you’re satisfied with the soup’s flavor, add in your noodles. Let it sit on that low heat for about five minutes, just long enough to bring the noodles up to temp. Serve! I hope you enjoy the chance to put together some warm and filling like this while still feeling like you’ve been a little adventurous with your flavors. Keep in mind, little grocery stores like Sakura are found all over the place, and they’re a great way to try new cooking styles. In addition to the Japanese market, I’ve got African, Hallal, and Mexican grocery stores close by too, and I’ll definitely be playing around with ingredients from all of them! When I do, I promise to share the experiences and recipes with all of you!